National Geographic honours Gwaii Haanas as an outstanding cultural tourism site. Gwaii Haanas has been selected as one of three finalists for a National Geographic Traveler World Legacy Award in the Sense of Place category. 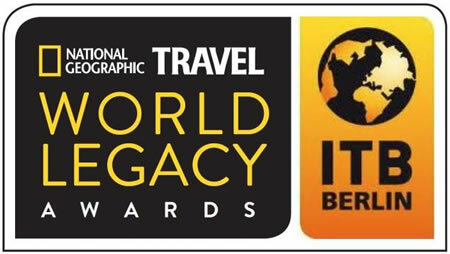 These awards are a new initiative of the National Geographic Society in partnership with ITB Berlin, the world’s largest travel trade show. See the National Geographic News Release. “Everything is connected in Gwaii Haanas. From temperate rain forests to abundant sea life and carved monumental poles, all natural and cultural treasures in this unique protected area provide a glimpse into the Haida way of life. Thank you, for helping us share this special place with the world,” said Ernie Gladstone from Vancouver in response to the announcement at ITB Asia in Singapore on Oct. 29 (Mr. Gladstone is available in Vancouver for interviews on Oct 29 after 1:30 pm. The awards will be given out at ITB Berlin in March 2015.
sustaining Haida culture by supporting the Watchmen program where Haida of all ages live at cultural sites, connecting visitors to these places and carrying out traditional activities like carving, weaving and food gathering. Commissioning the 42-foot Gwaii Haanas Legacy Pole to celebrate 20 years of cooperative management. Three young Haida artists led by carver Jaalen Edenshaw brought new energy to the continuum of monumental art on Haida Gwaii in 2013. Carved red cedar poles used to line the beaches in Haida villages and marked the stories of families, crests and events. Many poles were removed from villages after contact with Europeans. Although new poles have been raised over the last 40 years, this was the first pole raised in the Gwaii Haanas area in 130 years. More than 400 people travelled to remote Hlk’yah GaawGa (Windy Bay) by boat or seaplane to witness the pole raising live and the story was featured in the New York Times, Berliner Zeitung, Huffington Post, The Globe and Mail, CBC The National and dozens of other print, television, radio and magazine features. Together, the Government of Canada and the Council of the Haida Nation manage Gwaii Haanas National Park Reserve, National Marine Conservation Area Reserve and Haida Heritage Site at the southern tip of Haida Gwaii, an archipelago off the west coast of northern BC. Here, the Haida Gwaii Watchmen watch over important cultural sites including the standing poles at SGang Gwaay, a UNESCO World Heritage Site. Gwaii Haanas is also home to giant Sitka spruce, feasting humpback whales, salmon and herring, and a significant proportion of the world’s nesting seabirds. Earth changers: Recognizing cutting-edge leadership in environmentally friendly business practices and green technology, from renewable energy and water conservation to zero-waste systems and carbon emissions reduction. Sense of Place: Recognizing excellence in enhancing cultural authenticity, including implementing vernacular architecture and design, support for the protection of historic monuments, archeological sites, indigenous heritage, and artistic traditions. Conserving the Natural World: Recognizing outstanding support for the preservation of nature, including restoring natural habitat, and protecting rare and endangered species, whether on land or in the oceans. Engaging Communities: Recognizing direct and tangible economic and social benefits that improve local livelihoods, including training and capacity building, fair wages and benefits, community development, health care, and education. Gwaii Haanas has been selected as one of three finalists for a National Geographic Traveler World Legacy Award in the Sense of Place category " Recognizing excellence in enhancing cultural authenticity, including implementing vernacular architecture and design, support for the protection of historic monuments, archeological sites, indigenous heritage, and artistic traditions."